We had a great time in your beautiful cabin retreat. We hope to return soon! Amazing view! Loved this house and would like to rent it again. We recommend the Polar Express and hiking. Our favorite memory was being with family. The kids room is a big plus! My favorite thing about the stay was cooking with my wife and having privacy through out the property. We would recommend Nantahala Brewery and Restaurant. This is an amazing cabin to stay in. After a few days, it felt like home. Hoping to get the whole family here soon. Just delightful. We spent out 1st Thanksgiving away from home (Florida) in 32 years. This was the best of them. We will be back next year to spend Thanksgiving in a slightly larger cabin with our children. We were that impressed with our trip here. We loved the cabin, loved Bryson and the Smoky Mountains. Our stay was one for the memory books. Totally relaxing and enjoyable. We enjoyed your cabin so much. It was the perfect meet up spot for the family coming for Thanksgiving dinner from GA, SC, and MI. Kitchen was perfect for cooking dinner. We toured Murphy, Franklin and Bryson City. Played pool and used the Hot Tub! This was our second trip to Baines Mtn and we love the area and the views. We spent Thanksgiving weekend here at the cabin. What a beautiful home. We loved the amazing view and all the extra blankets. The kids enjoyed the Polar Express and the Hot Tub. WE shall be back! Everyone enjoyed hanging out together, playingng cards, watching movies, reading books, napping and of course the beauty of the mountains. Fabulous location to spend our Thanksgiving. We enjoyed the Great Smoky Mountains Railroad, the road to nowhere and hiking up Clingmons dome. But lazing around the cabin and soaking in the Hot Tub was the best part. We will be coming back! The cabin was s o much more than we expected! Watching the sunrise and sunset from here is breathtaking. Beautiful laughter alone with my family here has truly been priceless! We came to relax and that's what we did. Thank you for opening up this place for us. Truly memorable. I don't want to leave! 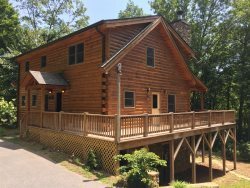 This is our 4th year renting cabins with GSCR. The team members are very helpful and accommodating. The website is easy to maneuver. Any questions are quickly answered. We've rented cabins with other rental agencies, but your cabins and your service surpass the others. Five stars!! It was peaceful. Beautiful. Relaxing. Everything we needed, and more. Our favorite was he view. Watching the sun rise over the mountain. Or the fog swallow up everything around us. Sitting on the steps watching the stars. Or the birds and squirrels enjoying the bird feeders. Our favorite thing about the stay was the view! We loved plating Corn Hole - Had a Tournament (Team Dunescape Break for the Win) Took lots of group pictures. We enjoyed eating at Peters Pancakes in Cherokee and CJ's Grille - Karaoke with Kevin!